This smoked ham is coated in a homemade spice rub, cooked in a smoker, then brushed with a homemade brown sugar and maple glaze. 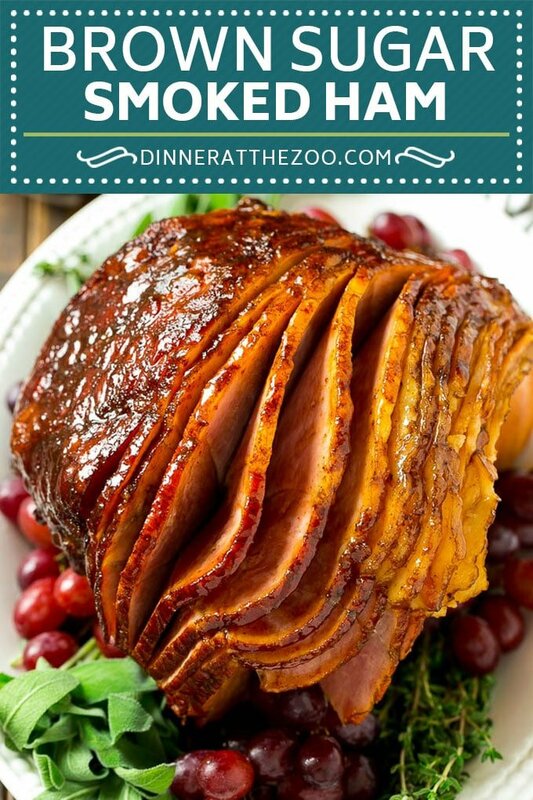 The ultimate holiday ham recipe that doesn’t require any oven space! I love a good holiday ham, some of my favorites include pineapple ham and Coca Cola ham. This smoked ham is tender and full of flavor from the sweet and savory spice rub and glaze. It’s become a must-have at all of our family celebrations. My biggest problem with cooking for the holidays is that I run out of oven space. You can only fit a few things into the oven at one time, and I find that sometimes things don’t cook properly if the oven is too full. I solve this problem by relying on other cooking methods, like a slow cooker, Instant Pot, or a smoker. This smoked ham cooks outside on the smoker, leaving you plenty of oven space. And it happens to taste absolutely amazing! The first step is to select your ham. I use a pre-cooked, spiral cut ham. Keep in mind that the overwhelming majority of hams have already been smoked, so when you cook those pre-prepared hams on a smoker for your holiday meal, you actually end up with a twice smoked ham. I find that despite being twice smoked, the smoke flavor is not overwhelming at all and is absolutely perfect when paired with a homemade glaze. The first step in the process is to coat your ham in a spice rub. I use my homemade BBQ rub which has the perfect amount of sweet and savory seasonings. You can rub your ham right before smoking it, or season it the night before to let the spices fully permeate the meat. What temperature do you smoke a ham? I smoke my ham at a temperature of 250 degrees F. You can also run your smoker at a higher or lower temperature, just be aware that the cook time will change accordingly. How long does it take to smoke a ham? It typically takes about 20 minutes per pound to smoke a pre-cooked ham. The internal temperature of the thickest part of the ham should register 140 degrees F when it’s completely warmed through. I find it works best to use a remote thermometer so that I can leave the probe in the ham inside the smoker, yet still monitor the temperature of the ham from inside the house. For a bone in ham, you’ll want to estimate about 3/4 pound per person that you’re planning to serve. 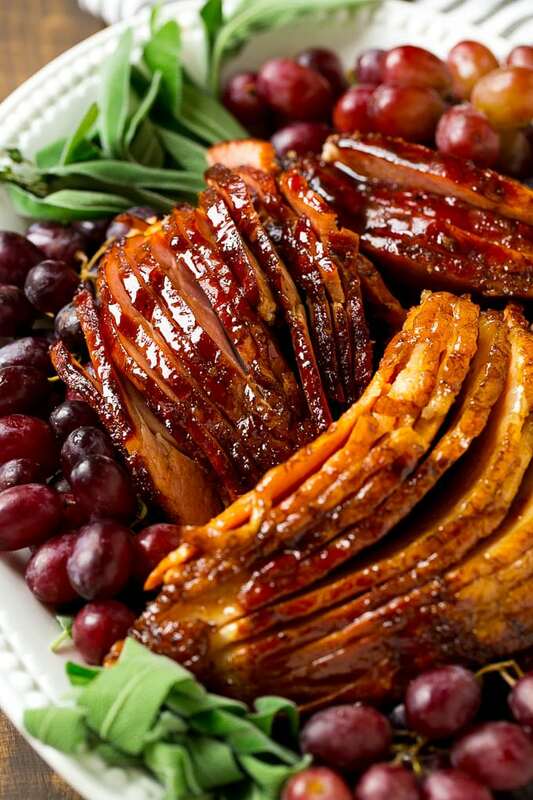 After the ham smokes for about an hour, you’ll want to start basting it every 30-45 minutes with apple cider. This keeps the ham from drying out. If you feel like your ham is looking a little dry, you can always cover it with foil inside the smoker after that initial hour. I really feel like it’s worth it to take a few minutes to make a homemade spice rub. If you’re short on time, store bought will work fine too. I use a disposable aluminum pan to smoke my ham to keep the mess to a minimum. Be sure to place the cut side of the ham face down in the pan as shown in the photos. 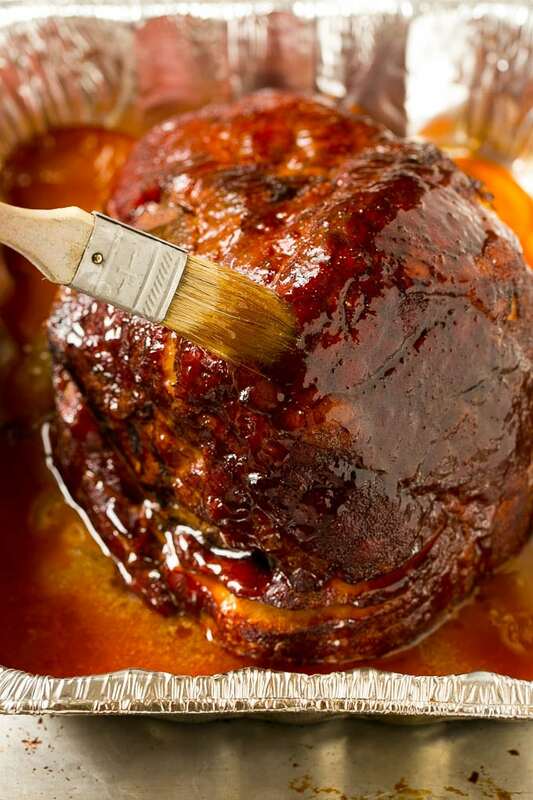 Once the ham temperature registers around 135 degrees F, start preparing your glaze. Garnish your ham with an assortment of herbs and fruit such as grapes for a beautiful presentation. What is the best wood for smoking ham? I use apple wood chips for this recipe, it compliments the apple flavor in the glaze and doesn’t impart an overly smoky flavor. Other good choices would be hickory or cherry wood. The final step in this recipe is to make the glaze, which is a mixture of butter, brown sugar, maple syrup and apple cider. Brush it all over the ham and dinner is ready! What do you serve with smoked ham? 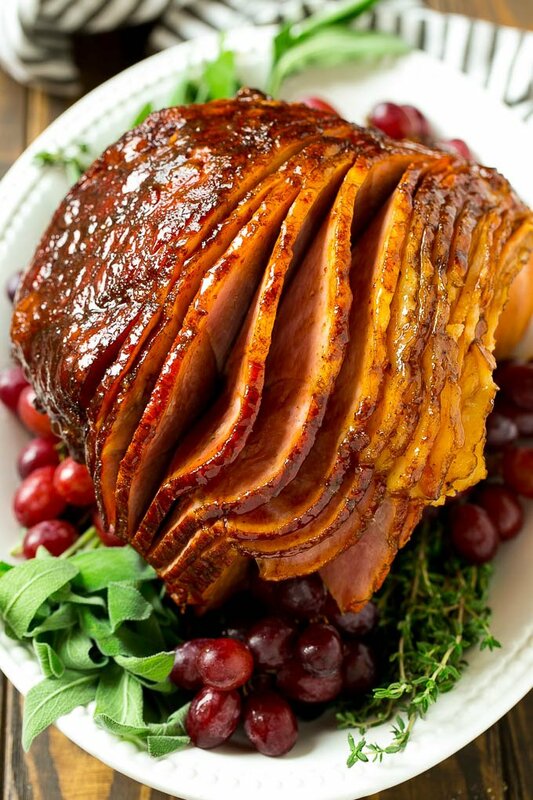 Brown sugar smoked ham is the ultimate main course for a special occasion. It’s so incredibly flavorful and is very unique compared to your typical ham offerings! 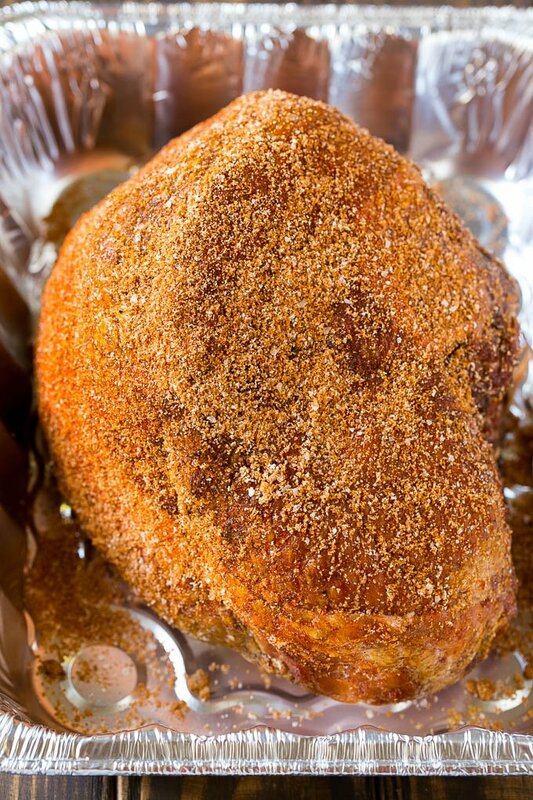 This smoked ham is coated in a homemade spice rub, cooked in a smoker, then brushed with a homemade brown sugar and maple glaze. 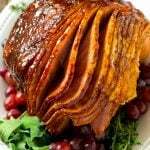 The ultimate holiday ham recipe that doesn't require any oven space! Preheat a smoker to 250 degrees F. Load the smoker with cherry wood chips. Coat a disposable aluminum pan with cooking spray. Place the ham cut side down in the pan. Sprinkle the spice rub all over the exterior of the ham. Place the pan in the smoker and cook for one hour. Continue to cook the ham for another 2-3 hours, basting every 30-45 minutes with the 2 cups of apple cider. The ham is done when a thermometer inserted into the thickest part of the ham reads 140 degrees F.
While the ham is smoking, make the glaze. Place the butter, brown sugar, maple syrup and remaining 1/4 cup of apple cider in a pan over medium heat. Bring the pan to a simmer. Cook for 6-8 minutes or until glaze has just thickened. Brush the glaze all over the ham. Transfer the ham to a platter. Garnish the ham with herbs and fruit if desired, then serve. This recipe is best with my homemade BBQ rub recipe. I’m making this tomorrow for Easter lunch. Cant wait to christen my new smoker with this ham recipe!!!! Are the quantities for the rub and glaze ingredients figured for a 7 lb ham? In other words, would I need to double these for a 15 lb ham? Yes the rub and glaze ingredients assume a 7 pound ham, I’d double everything for a 15 pound ham! Is the recipe calling for apple cider or apple cider vinegar?? Thanks! It calls for apple cider not vinegar! The recipe sounds great! I plan on firing up the smoker tomorrow, but wanted to get your thoughts on the timing. From the time the ham is done, it may be an hour or two until we actually eat (due to traveling). What would you recommend after pulling the ham from the smoker? Wrap it in foil to keep it warm, then do the glaze right before serving maybe? Thanks in advance! Yes that sounds like the perfect plan. If you need to re-warm the ham when you get there, you can warm it covered in a 325 degree oven! Would anything change if I bake it? Would it come out ok?? 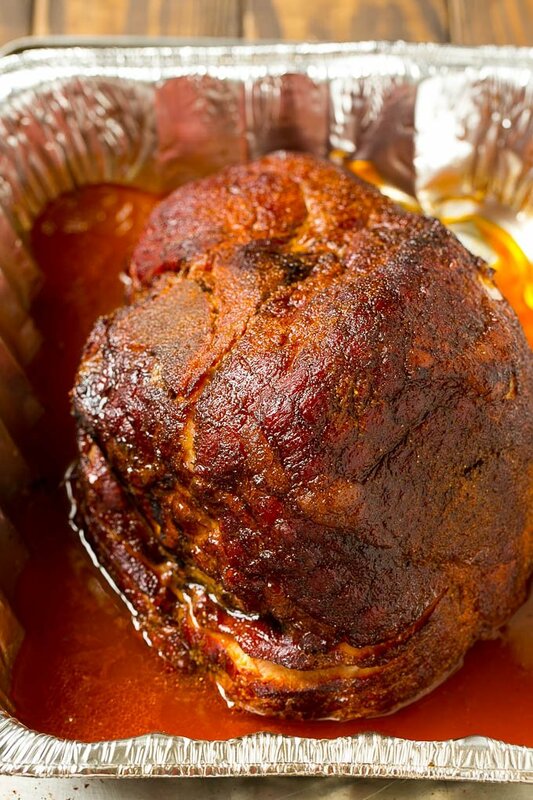 I have had brown sugar ham but never smoked – that must really increase the flavors so much. This looks so flavorful. The combo of maple syrup and brown sugar must add such a nice sweetness and richness to the ham. Oh this has all the right flavors! It is one of the meats I love to eat a bit sweet! That is the way I like to make my ham. This looks so delicious! We are some ham-eating fools at our house! Your BBQ rub sounds amazing. I’ll have to make this recipe for my family! That smoked ham looks really good. Nice and moist and the sauce, yum. Thank you for sharing. Oh my! That looks simply amazing! It looks juicy and very flavorful! Great recipe!